Autumn is on the way; Mother Nature is putting on a glorious show. Late-summer and early-fall flowers are blooming, the colors of leaves are starting to change, and there's a crisp, cool, feeling in the air. 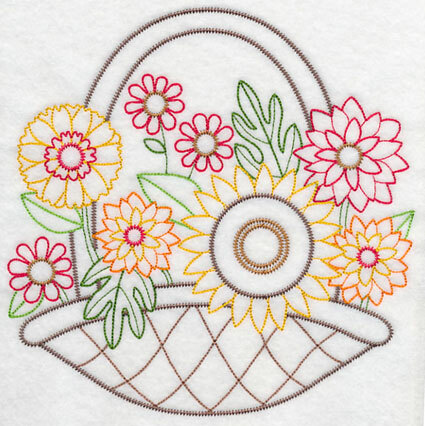 New designs bring the beauty of this season to your embroidery projects. 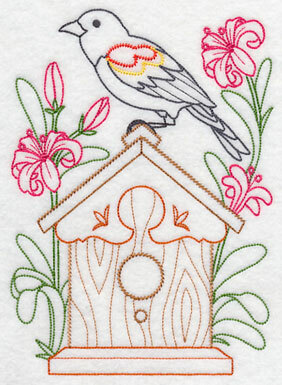 Quick-to-stitch birds in fall flowers are charming additions to tea towels, table linens, and reusable grocery totes. 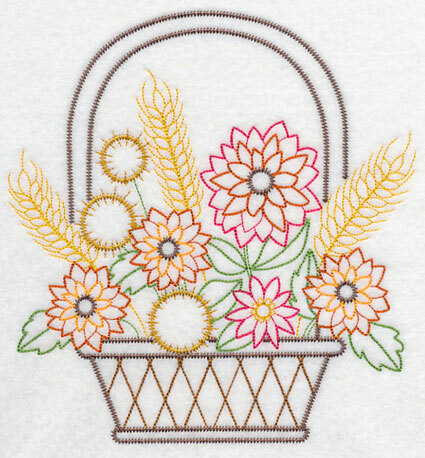 Autumn blossoms in baskets are a blend of whimsical and primitive styles. You'll fall in love with these autumn designs! Scroll down the page to see the new designs, and enjoy adding the beauty of the season to your home! There's a hot new twist to the classic log cabin quilt block. Click here for the tutorial! The seasons are changing, and landscapes are bursting with late-summer and early-autumn colors. 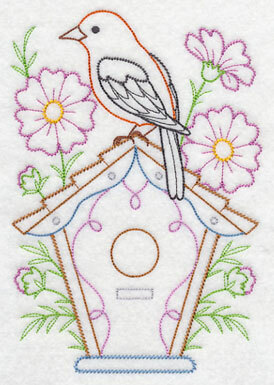 These designs capture nature's beauty, and let you bring it to your embroidery projects. Birds perch on houses, surrounded by flowers in fall hues. These designs are in a light-and-lively vintage style, so they're lovely on smooth fabrics, like quilter's cotton, flour sack towels, and tea towels. 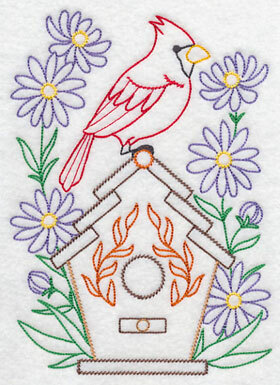 Below on the left is a cardinal in asters; the right shows a bluejay in chrysanthemums. 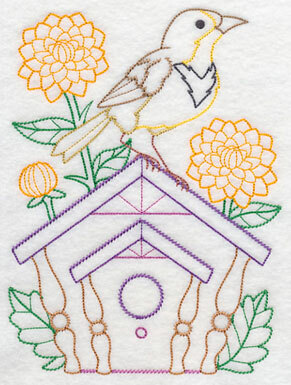 5.80" x 7.80" and 4.86" x 6.54" and 2.89" x 3.90"
A chickadee perches on a house in blooming marigolds, and a red-winged blackbird prepares to take flight from his perch among nerines. These designs have open areas, making them a good fit for smooth fabrics. Use them in blocks for nature-loving quilts and wall hangings. 5.65" x 7.81" and 4.86" x 6.72" and 2.80" x 3.86"
A meadowlark flirts among dahlias while a yellow warbler rests in goldenrod. 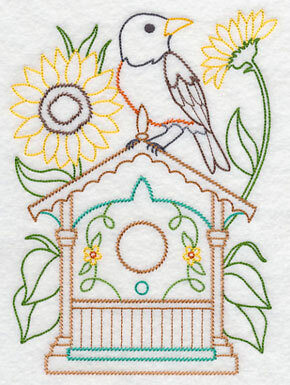 Each of the birdhouses has unique and interesting details, adding interest and texture to these quick-stitching designs. 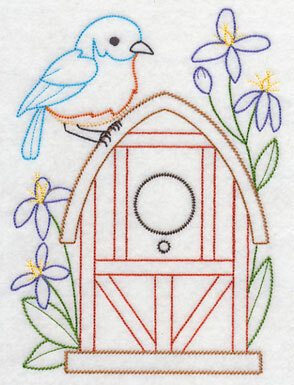 5.77" x 7.81" and 4.89" x 6.61" and 2.89" x 3.90"
A bluebird's barn-shaped house is beautifully arranged in clematis, while a scarlet tanager perches in blooms of cosmos. 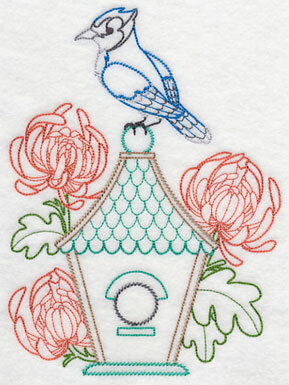 We embroidered the houses and flowers in classic autumn hues; use brighter shades for mid-to-late-summer themes. 5.45" x 7.80" and 4.82" x 6.90" and 2.71" x 3.90"
A robin is cheerful in sunflowers, and a nuthatch enjoys his view from the colchiums. 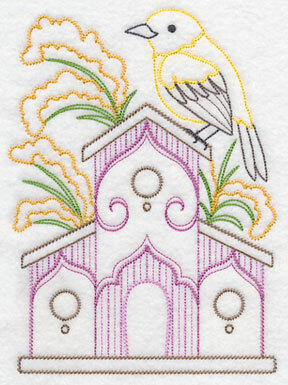 These vintage-style designs have open areas and unique texture in the stitches. 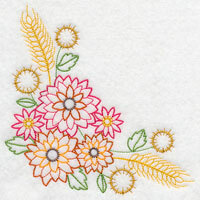 They're reminiscent of the classic hand embroidery style, but stitch with speed and precision on your embroidery machine. 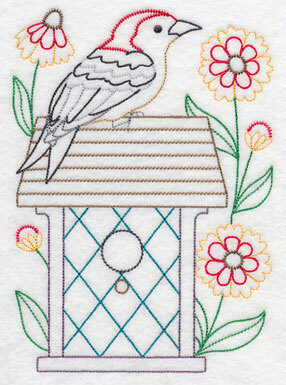 5.66" x 7.80" and 4.85" x 6.69" and 2.82" x 3.90"
A woodpecker poses in heleniums while a goldfinch perches on his house in black-eyed susans. 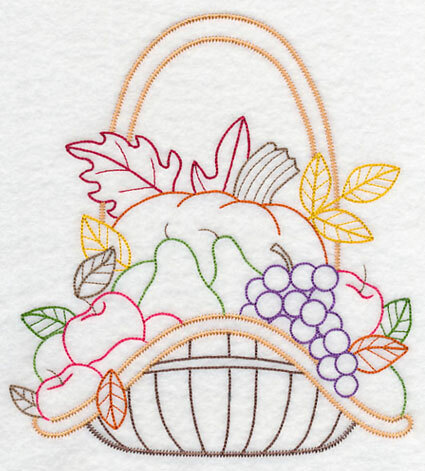 Add these beautiful autumn colors to your embroidery projects! Use the designs on quilter's cotton, twill, linen, or other smooth fabric. 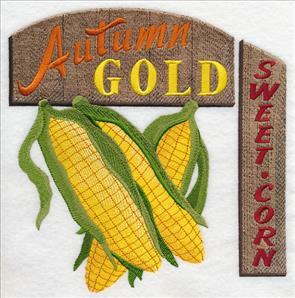 Make table linens, quilts, wall hangings, and sets of kitchen towels to bring autumn's beauty to your home decor. 5.80" x 7.80" and 4.89" x 6.57" and 2.90" x 3.89"
The twelve birds and houses in autumn flowers are a wonderful way to bring nature's beauty to your home. 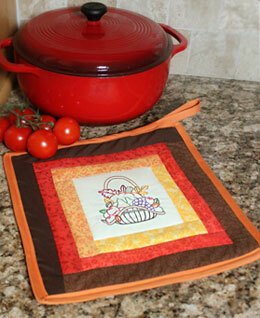 Lovely on table linens, tea towels, flour sack dish towels, wall hangings, quilts, and more! The open and airy style means that they are quick to stitch, and work best on smooth fabrics. In autumn, Mother Nature puts on a gorgeous show. Trees are ablaze in shades of gold and red, and wild grasses turn golden, then brown. 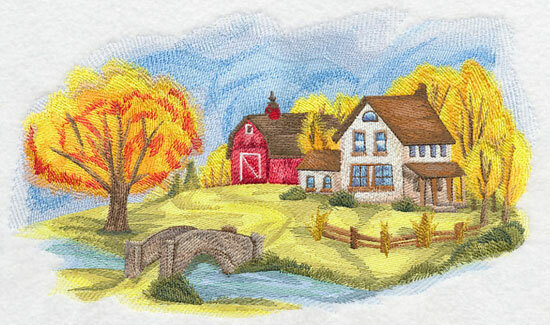 This design shows autumn in all its beauty: a farm scene surrounded by fall colors. 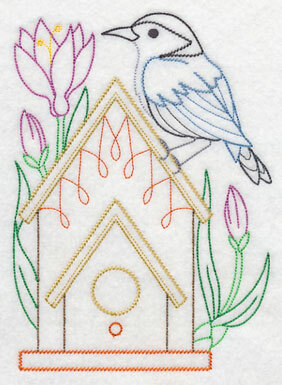 If you're new to working complex designs, or designs with a high stitch count, then this tutorial will be an excellent guide. 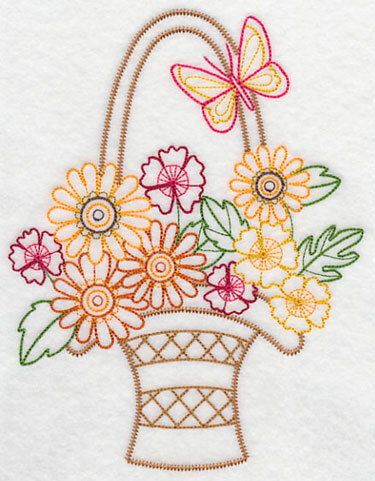 11.69" x 6.79" and 9.39" x 5.44" and 7.79" x 4.49" and 6.86" x 3.99"
Fall flowers are arranged in a basket, complete with a butterfly! This design is a lovely blend of whimsical and primitive styles. It's light-and-lively with open areas, and a perfect fit for quilter's cotton, linen, twill, tea towels, and other smooth fabrics. 5.86" x 7.58" and 4.84" x 6.24" and 3.01" x 3.90"
Pair the design above with a border and corner for a well-coordinated look! 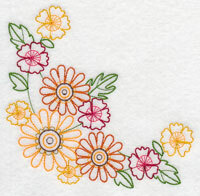 Use the trio on tea towels, table linens, quilts, and more. These designs are in a vintage style, meaning that they're quick-to-stitch embellishments, and work best on smooth fabrics. 11.75" x 3.34" and 9.40" x 2.67" and 7.80" x 2.22"
5.96" x 5.86" and 4.94" x 4.86" and 3.89" x 3.83"
Sunflowers are bright and happy, arranged in a basket with other fall flowers. 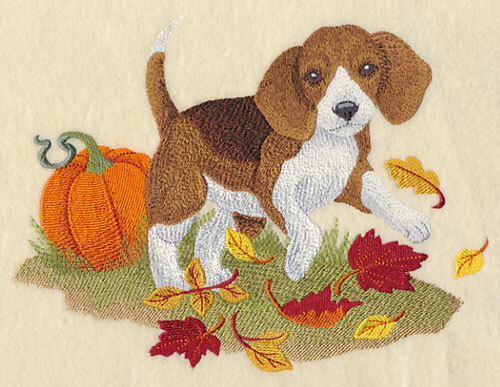 Delightful on tablecloths and runners, quilt blocks, seasonal pillow covers, and more. 7.78" x 7.80" and 5.90" x 5.92" and 4.88" x 4.91" and 3.86" x 3.89"
Coordinate the above basket with the matching border and corner designs! Sunflowers take center stage, adding a happy and cheerful look to home decor. 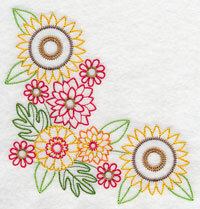 These designs are lovely as accents to quilts, as well as placemats and linen napkins. 11.75" x 2.85" and 9.40" x 2.29" and 7.80" x 1.90"
5.85" x 5.85" and 4.85" x 4.86" and 3.89" x 3.89"
Vintage fall flowers are arranged with colorful wheat, resulting in a beautiful autumn basket. This vintage-style design is quick-to-stitch, and works best on smooth fabrics. Add it to quilter's cotton, twill, and linen. 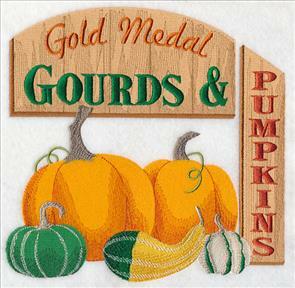 Make tea towels, placemats, and table runners with beautiful fall flair! 7.40" x 7.80" and 5.85" x 6.16" and 4.82" x 5.09" and 3.65" x 3.88"
A coordinating border and corner is lovely when paired with the above basket. 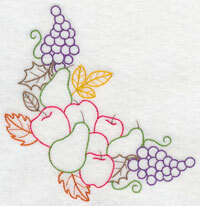 Use on quilts, wall hangings, table runners, placemats, and more. The corner is especially nice on a linen napkin! 11.75" x 3.25" and 9.41" x 2.60" and 7.80" x 2.16"
5.86" x 5.85" and 4.86" x 4.85" and 3.90" x 3.90"
The farmers markets are filled with autumn's bounty. 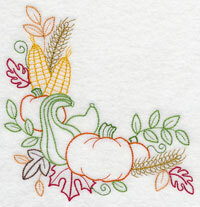 This vintage-style design features a medley of fruit and vegetables, with colorful fall leaves added for fun. 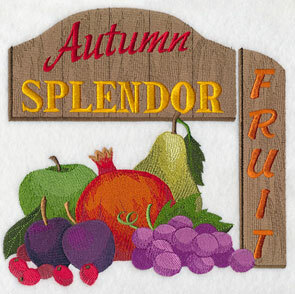 A pumpkin, pears, grapes, and apples are ripe and delicious on kitchen towels, aprons, and table linens. 7.14" x 7.80" and 5.89" x 6.43" and 4.87" x 5.33" and 3.53" x 3.87"
A coordinating border and corner adds a delicious and flavorful look to kitchen items! 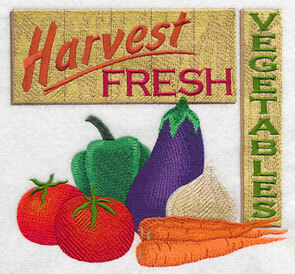 Add to placemats, table runners, and napkins. 11.75" x 3.54" and 9.41" x 2.84" and 7.80" x 2.35"
5.86" x 5.89" and 4.86" x 4.89" and 3.87" x 3.89"
Corn, squash, wheat, and leaves are beautifully arranged in a primitive-style basket. 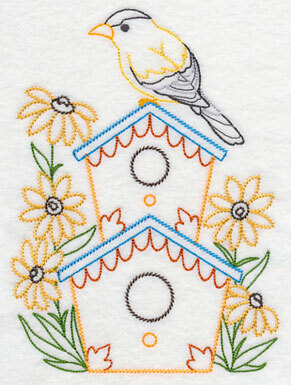 Unique vintage stitches are reminiscent of hand embroidery, but have speed and precision on your embroidery machine. Use on the bodice of an apron, or on a tea towel, to bring a lovely autumn look to your home. 7.02" x 7.80" and 5.85" x 6.49" and 4.84" x 5.38" and 3.47" x 3.88"
Add a coordinating border and corner to the design above! Lovely on table runners, towels, and more. The corner is especially nice on a linen napkin. 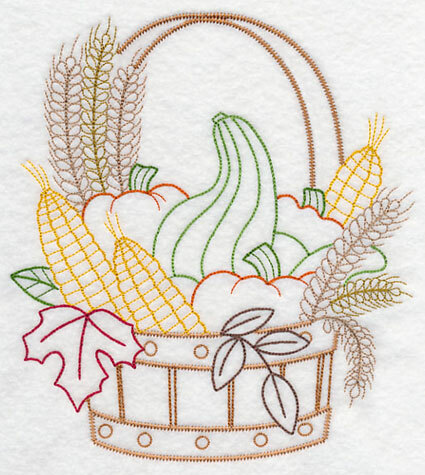 These quick-to-stitch designs bring lovely fall color - and autumn flavor - to your projects. 11.75" x 3.65" and 9.41" x 2.92" and 7.80" x 2.43"
5.86" x 5.95" and 4.86" x 4.94" and 3.84" x 3.90"
These medleys are inspired by classic farmers market signs. When we created these designs, we used a special technique of blending and shading to create the wood-grain effect. Rest assured, the color change sheets for the designs show you the colors that we used for the samples, so there's no need to guess at the colors! 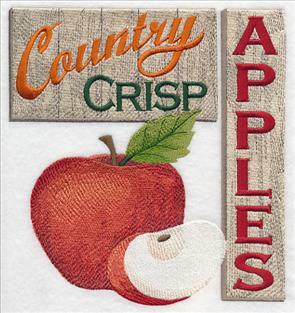 Stitch fruit and apple signs onto canvas tote bags, denim wall hangings, and pillow covers, for a charming country effect. 7.81" x 7.82" and 6.85" x 6.87"
6.89" x 7.45" and 5.85" x 6.33" and 4.86" x 5.26"
Ripe pears and fresh vegetables are featured in these farmers market signs. These designs are complex with shading and highlighting to produce a realistic effect. 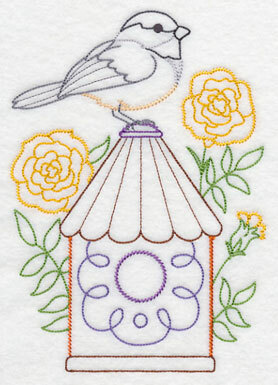 Embroider onto sturdy low-or-no-stretch fabric, like duck cloth, canvas, denim, or home dec fabrics. 7.41" x 6.89" and 6.28" x 5.84" and 5.21" x 4.85"
Bring the beauty of autumn's bounty to your home with these designs! They're lovely on the bodice of canvas or sturdy twill aprons. Add to denim wall hangings and pillow covers, or duck cloth grocery totes. 7.74" x 7.79" and 6.88" x 6.92"
7.59" x 7.81" and 6.91" x 7.11"
5.86" x 6.03" and 4.86" x 4.99"
Autumn's bountiful harvest is reflected in these delicious designs. 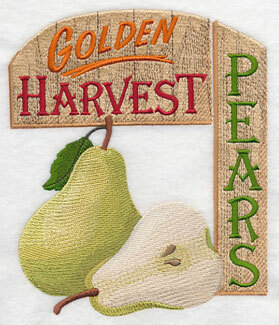 Add a tasty look to kitchen wall hangings, aprons, grocery totes, and more! Order the designs individually by clicking the links above, or get them all in a design pack. Four sizes are available to suit a variety of projects. Jewell is especially fond of Barquesmore the Beagle. She's enjoyed him in his other poses and settings, such as Halloween, summer, Christmas, and spring. And, she's been eagerly awaiting an autumn version of the playful pup. Jewell, we're pleased as punch to fulfill your special request this week, and appreciate the time that you took to send it in. The "request of the week" program is a popular one and we're all booked up through 2015 and beyond. The queue is full to the brim with excellent and creative ideas! But we're always happy to have more. 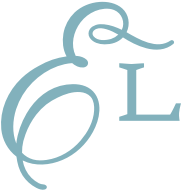 Send your design ideas to us at this email address: support@emblibrary.com. 7.77" x 5.85" and 6.42" x 4.85"